The wastewater treatment and recycling plants, of which Fraccaroli & Balzan S.p.A. is the world leader since the 1970’s, make it possible to fully recycle the water used in industrial processes and to re-use it in a continuous cycle, without any losses into the environment. The residual mud is dehydrated and can be dumped without problems. 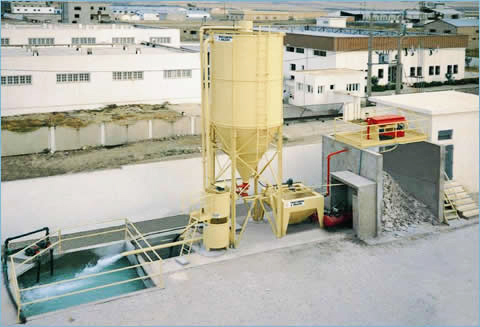 The wastewater treatment plants are used in very many different sectors, like stone processing factories, quarries, crushing plants, ceramic industries, aggregates. Click to see video on how a filter press works! Miles Supply is pleased to offer Fraccaroli & Balzan water treatment systems. Fraccaroli is known throughout Europe for this high quality equipment. With Miles Supply, Fraccaroli is able to determine what size water treatment system is best for your needs. These systems remove the need for “Sludge Pits” and the need to clean them every month. These units are self-contained and separate the waste product and the water. In the end, the recycled water returns to your plant for use. Call us today, so that we may determine what system is best for your needs. Decantation of wastewater and dehydration of mud coming from the industrial processing of marble, granite, and stone. Click here to press QUOTE button for info.